Strategic management is the process of defining the purpose and pursuits of an organization and the methods for achieving them. Robert Grant emphasizes that competition provides the rationale for strategy because strategy is about winning. It follows then that the inter-dependence of competitors is the essence of strategy—actions of individual competitors and teams of competitors affect outcomes for other participants. In other words, organizational leaders must "play the game" strategically because their organizations are involved in a game of strategy (e.g., chess) not simply a game of chance (e.g., bingo) or a game of skill (e.g., tennis). Of course, the necessary skills must exist, and at times things will happen that were not predictable. However, each organization must have a strategic focus if it intends to survive and flourish in the long term. Mission—Why does the organization exist? Internal and External Assessments—What are the internal strengths and weaknesses and external threats and opportunities? Vision—Where does the organization want to be in the future? Goals and Objectives—What are the overall, high-level desired results as well as specific, measurable outcomes required to achieve the mission and vision? Strategy Implementation—execution or deployment of the strategic plans. Measurement and Feedback—the monitoring and feedback element answers the questions "How is the organization doing?" "What modifications and improvements are necessary?" Core Competencies—What are our best capabilities? Distinctive Competencies—Which of our competencies are unique and not easily replicated? Core Values—What do we care about as an organization? What are our shared values? Critical Success Factors—What do we have to do right to be successful? Leadership Competencies—What leadership characteristics and competencies do we require of our managers and non-managers? In the 1960s and 1970s, strategic planning was viewed by executives as the best way to ensure productivity and profits. The assumption was that everything that was of potential value to decision making and strategic planning could be measured, and that after subjecting those measurements to various quantitative models, results would show executives the best strategies. In the early 1960s, professors Ken Andrews and C. Roland Christensen of the Harvard Business School contended that strategy could be a potentially powerful tool for linking business functions and assessing a company's weaknesses and strengths in relationship to its competitors' strengths and weaknesses. General Electric emerged as a pioneer in the area of corporate strategic planning and developed a high-powered staff of full-time strategic planners to direct GE's planning efforts. With the assistance of McKinsey and Company, GE was organized into strategic business units (SBUs) and strategic plans were developed for each SBU. In 1963, the Boston Consulting Group pioneered a variety of strategic approaches that became popular with executives. Two of BCG's approaches were the "experience curve" and the "growth and market-share matrix." The trust of executives in strategic planning models increased throughout the 1970s, and perhaps peaked with the publication of "Competitive Strategy," by Harvard professor Michael E. Porter in 1980. Porter's books and articles continue to have a tremendous influence on many executives, university students, and professors. By the early 1980s, some executives began to feel that the return on their investment in the development of large strategic planning departments had been a disappointment. Also, the increase in computer technology and globalization of industries caused increased complexity in those industries, and the strategic models of the 1960s and 1970s could not deal with the complex dynamics of the new marketplace. The death knell for strategic planning began when General Electric chairman Jack Welch significantly downsized the GE operating units' planning departments. Many other executives followed Welch's example during the 1980s and 1990s. Strategic planning was replaced in the minds of executives with thoughts of improving quality and productivity through operational innovation. The most prominent of these approaches included total quality management (TQM) and the Quality philosophies of Deming, Juran, and Crosby. In the 1990s, corporations began to focus on process reengineering and downsizing as a way of increasing operational effectiveness even more. Process Reengineering, an idea authors Hammer and Champy espoused was accepted by many as an additional strategy toward increased productivity. In the 1990s, strategic planning was reborn. New approaches for strategy focused on growth through mergers/acquisitions and joint ventures, generation of innovative ideas through decentralized strategic efforts within the company, emergent strategy, and the leveraging of core competencies to create strategic intent. The dominant theme for organizations in the twenty-first century is strategic and organizational innovation, and issues include reconciling size with flexibility and responsiveness. New alliances mean cooperative strategies, complexity, changes in commitments of corporate social responsibility, etc. Today's strategic planning requires new models of leadership, less formal structures, and more commitment to self direction. Also, past strategic failures relating to ethical problems require renewed commitments to ethical standards. 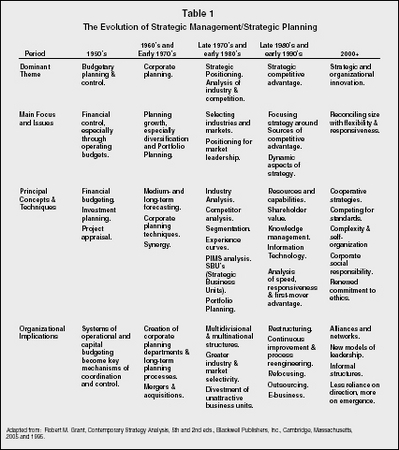 Strategic management has evolved from the 1950s when its theme was budgetary planning and control to the twenty-first century when its theme is strategic and organizational innovation. See Table 1. Adapted from: Robert M. Grant, Contemporary Strategy Analysis, 5th and 2nd eds., Blackwell Publishers, Inc., Cambridge, Massachusetts,2005 and 1995. Dominant Theme Budgetary planning & control. Corporate planning. Strategic Positioning. Analysis of industry & competition. Strategic competitive advantage. Strategic and organizational innovation. Main Focus and Issues Financial control, especially through operating budgets. Planning growth, especially diversification and Portfolio Planning. Selecting industries and markets. Positioning for market leadership. Focusing strategy around Sources of competitive advantage. Dynamic aspects of strategy. Reconciling size with flexibility & responsiveness. Principal Concepts & Techniques Financial budgeting. Project appraisal. Medium- and long-term forecasting. Portfolio Planning. Resources and capabilities. Analysis of speed, responsiveness & first-mover advantage. Cooperative strategies. Organizational Implications Systems of operational and capital budgeting become key mechanisms of coordination and control. Creation of corporate planning departments & long-term planning processes. Mergers & acquisitions. Multidivisional & multinational structures. Greater industry & market selectivity. Divestment of unattractive business units. Restructuring. Continuous improvement & process reengineering. Informal Less reliance on direction, more on emergence. responding to new environmental pressures. So in this era of dramatic change, global alliances, and a variety of environmental pressures, the potential for failure is very real. Henry Mintzberg believes that the strategic planning models of the 1960s and 1970s ultimately failed because they did not distinguish between strategic planning and strategic thinking. Traditional strategic planning models were heavily oriented to quantitative analysis, the results of which directed the executive towards what strategy should be taken. These planning models actually subverted strategic thinking that involves the synthesis of one's experience, intuition, and creativity, in addition to analysis. Traditional strategic planning was not useless, but it should have been done after strategic thinking and vision development had taken place. Another problem with traditional strategic planning was that it did not include in the planning process those who had to implement the strategic plan. The strategic planning was done at the very top of the organization, or by expert consultants, and the strategic plan was handed down to managers in bound, published documents. People often felt less than committed to such plans, and the documents themselves often did not take into account the actual business challenges these managers faced on a day-to-day basis. At lower levels in the hierarchy, the problem was even more severe because planning was often used to exercise blatant control over people. Mintzberg notes that another reason traditional strategic planning failed was because it was based on some fundamental flaws: (1) the fallacy of prediction; (2) the fallacy of detachment; and (3) the fallacy of formalization. Traditional strategic planning was based on the assumption that one could measure all of the variables that were relevant to the future of a business, analyze the results, and construct strategies based upon the results that, if followed, would ensure future success. However, even the best strategies experience unforeseen economic, industry, social, and market shifts. The fallacy of prediction inevitably led to the downfall of traditional strategic planning, because the strategies could not deliver what they promised: predictable success. Traditional strategic planning assumed that it was better to be detached from the workers and from middle managers when analyzing data, in order to prevent bias in the planning process. However, this simply separated the strategy makers from the strategy implementers, which turned out to be a fatal mistake. When problems of implementation arose, both sides pointed fingers at each other as the cause for the failure. Additionally, traditional strategic planning was often based on inappropriately aggregated data, data that was no longer current, or data that did not have important contextual information linked to it. Also strategic planners often ignored qualitative data, thus creating huge blind spots in the final strategic plan. This fallacy is based on the notion that formal systems are superior to human systems in terms of information processing and decision making. Mintzberg believes that though formal systems might be able to process larger amounts of data than humans can, formal systems cannot integrate, synthesize, or create new directions from such analyses—only humans can perform the latter processes. We think in order to act, but we also act in order to think. Our experiments that work converge gradually into viable strategies. Danny Miller offers another perspective as to why strategies often fail. In his landmark study, Miller investigated the decline of powerful corporations, and his findings have done much to help managers understand the causes of strategic and organizational failure. Miller named the model he developed from his findings, the Icarus Paradox after the tragic figure from Greek mythology. Icarus's father, Daedalus, was an inventor, who was asked to build a labyrinth for King Minos. Upon completion of his task, King Minos would not allow Daedalus to leave. Determined to escape, Daedalus built wings for himself and his son, Icarus, by adhering the wings of birds onto long boards with wax. Icarus was fascinated with the invention and was eager to try flying. Daedalus taught Icarus how to fly using his invention, but cautioned Icarus to fly only at a moderate height—neither too low nor too high. The escape was a success, but Icarus, ignoring the advice of his father, began gaining confidence in his ability to fly and grew more daring. He ultimately flew too high—too close to the sun—and the heat from the sun caused the wax to melt. His wings disintegrated and he plummeted helplessly to his death. The paradox of Icarus was that his skill and technology, which led him to freedom, ultimately also led to his death. Miller found in his research that the victories and strengths of companies can often be the cause of their future strategic failure. Miller delineated four major causes of strategic failure: leadership traps, monolithic cultures and skills, power and politics, and structural memories. All of these causes emerge while an organization is experiencing success-especially in its strategic initiatives. The impact of those tendencies on strategy making is very negative when strategy is developed from ego, preconceptions of what causes success, stubbornness, and old, worn conceptual models. MONOLITHIC CULTURES AND SKILLS AND POWER AND POLITICS. Miller found that another reason for strategic failure in organizations that have been successful is due to the fact that these organizations tend to rely on "star" departments and the culture that builds up around them. When certain functions take precedence over others in an imbalanced manner, other business functions are seen as less important, and perhaps even unimportant, to the success of the organization. Over time, the evolution of organizational cultures in successful companies usually becomes monolithic, intolerant, and focused on a single goal or very limited goals. Additionally, the star department attracts the best and the brightest managers away from other departments, so that the organization has an imbalance of managerial talent throughout the organization. Conversely, talented managers in departments outside the star department usually join companies that can appreciate their skills. Over time, managerial talent is diluted (excepted for within the star department) and becomes imbalanced throughout the organization. The "star" departments have more power, and people in these departments are able to use their power to play politics and gain even more resources and success. As managers in the star departments increase their power, they become less inclined to adjust the way they have always conducted business. Programs, policies, and practices that in the past, have proven successful and given these managers such high status are loyally adhered to, and the ability to make organizational adjustments becomes limited. The ultimate consequence of this type of power build-up in a company is that past strategies are perpetuated, often without a careful evaluation of their current effectiveness. Past successful strategies engender policies, routines, systems, and programs in a company, and the institutionalization of these processes within a company creates a powerful organizational culture. Miller notes that "the more established and successful the strategy, the more deeply imbedded it will be in such programs, and the more it will be implemented routinely, automatically, and unquestioningly. Managers will rely on ingrained habits and reflex actions rather than deliberating and reflecting on new problems." In these situations, the past fashions how one sees the present, and is a powerful force for continually choosing the same, or similar, strategic courses of action, both within the organization and outside the organization. Clayton M. Christensen, in his book The Innovator's Dilemma reported research findings that suggest that even when companies do follow sound management practices they still are exposed to events and problems that can cause strategic failure. The innovator's dilemma is that "the logical, competent decisions of management that are critical to the success of their companies are also the reasons why they lose their positions of leadership." He contends that good management involves sustaining the success of products and processes, and that companies are generally good at this. However, such companies can be blind sided by the emergence of disruptive technologies. These disruptive technologies are products or processes that appear in the marketplace, but that look harmless to the successful company. In the short term, they do not seem to pose much of threat, and thus they are ignored. However, over time, disruptive technologies can become a powerful force, and that when they do, successful companies are not organized or prepared to respond to what essentially is a new competitor in the market. Examples of disruptive technologies are the small, off-road motorcycles that were introduced by Japanese manufacturers into the United States. Over time, they threatened the product lines of Harley-Davidson and BMW. Health maintenance organizations (HMOs) strategically hurt traditional health insurers, and transistors killed the vacuum tube industry. Successful companies miss seeing the threat of disruptive technologies because they are essentially caught in the routine of maintaining the status quo, i.e., their current success. To spot future disruptive technologies and plan for combat against them, a company would need to invest resources in the scanning for, and development of, disruptive technologies; be willing to enter into the market when a potentially disruptive technology emerges; be adept at developing new ways of analyzing emerging markets; and be aware that improving their product, and increasing its price, creates vacuums at the lower price range for emerging technologies to enter. The goal is to be able to both sustain successful products and processes, yet at the same time be able to see, evaluate, and develop disruptive technologies. Failure of merging organizations to understand either or both complementary competencies and synergies as well as areas that are not complementary and synergistic. Failure to understand the culture of the organization. Failure to adequately execute the strategic plans. Failure to function as a team at the executive level or other levels. Failure to develop values and culture to support the plans. Failure to expeditiously do what is needed to be done. Failure to prevent ethical and legal problems. CEO Carly Fiorina positioned HP as perhaps the widest-ranging technology company in the world, with offerings from digital cameras, to printers, to supercomputers. She staked her career on HP's acquisition of Compaq in 2002, and she lost. She was fired on February 7, 2005. The acquisition had been bitterly opposed by major shareholders including Walter Hewlett. Under Fiorina's direction, HP unsuccessfully battled IBM, Dell, Sony, EMC, and others. Today, the $80 billion HP is struggling in everything except its stellar printing business. For months, Wall Street analysts have argued that HP's pieces/divisions would be worth far separately than they are together as a company. Fiorina fiercely resisting breaking up HP, and the Board of Directors insists that it will keep HP intact. HP has problems in enterprise computing. It is losing ground to EMC Corp. in storage and to Dell and IBM in servers. So much more is needed than simply replacing one or more top executives. How much HP energy was lost as Walter Hewlett and numerous employees and shareholders fought Fiorina's vision? How much more was lost as Hewlett was pushed off the board of the company his father founded? Fiorina was a decisive, gifted communicator. However, she fired or lost many executives, and she rigorously resisted changing strategies even as she made dramatic changes. She merged HP's 80-plus autonomous business units into a more centralized, four-division giant and eventually laid off thousands of workers. She had to also battle two cultures, HP and Compaq, both of which were very reluctant to change. Why did the strategic planning based on the company vision fail? It was difficult for HP executives to rapidly understand complementary and non-complementary competencies, strategies, and synergies as well as differences in the respective cultures. From the outside, it would appear that most of the failure can be traced lack of trust and support among the players—the board members, some members of the board and Fiorina, the employees and the company, the shareholders and the board, and the shareholders and Fiorina. Also, Fiorina never had the loyalty of the employees. Some insist say it was failure of Fiorina to execute her ambitious strategic plan, and that is the reason she was fired. One Business Week article says Fiorina broke three key rules that CEO's must follow: place the company's well-being above all else, including yourself; know your company from the inside out—some say that Fiorina did not fully comprehend the impact on operations of her vision to transform HP's structure and strategy; and hold people accountable, including yourself. Only history will tell whether HP will spin-off divisions or remain the one-stop shop that Carly Fiorina envisioned. The Xerox Board of Directors suddenly promoted Anne Mulcahy to president in May, 2000, after ousting G. Richard Thoman, who lasted thirteen months, and reinstalling Chairman Paul A. Allaire as CEO. The company was floundering after years of weak sales and high costs. Employees and customers were disgruntled. Then in October, Xerox reported its first quarterly loss in sixteen years. Debt was piling up, and the Securities & Exchange Commission began investigating whether Xerox used accounting tricks to boost income. Insiders and those outside of Xerox felt that Mulcahy had the strategic mind and toughness to serve as CEO. On July 26, 2004, Mulcahy was named CEO of Xerox. When Anne Mulcahy took over as CEO, Xerox was in terrible shape. It was fighting the Securities and Exchange Commission over accounting practices. It was $14 billion in debt, and bankruptcy was a real possibility. She was relentless in her efforts to stabilize Xerox. She made dramatic staff and business cuts. She brought in a new CFO. She met with numerous customers. Also, she got her people focused on turnaround and growth, which she says is the job of leadership. What caused strategic plans prior to Mulcahy to fail? Six former senior executives of Xerox settled an SEC enforcement action charging them with fraud and agreed to pay over $22 Million in penalties, disgorgement and interest. Specific charges included securities fraud and aiding and abetting Xerox's violations of the reporting, books and records and internal control provisions of the federal securities laws. In other words, instead of relying on strategic plans to work (or changing the strategic plans) Xerox's senior management had apparently substituted accounting manipulations for the company's actual operational performance. Certainly there was a failure to develop values and culture to support the strategic plans, and there were legal and ethical problems related to the lack of appropriate shared core values. Apparently the strategic plans were also not appropriate, or they had not been fully executed since both customers and employees were unhappy, sales were weak, and costs were high. "The Accidental CEO." Fortune, 23 June 2003, 58–65. Baldrige, Malcolm. National Quality Award Criteria. Washington D.C.: National Institute of Standards and Technology, 2004. "The Best Managers." Business Week, 10 January 2005, 56–67. Christensen, Clayton M. The Innovator's Dilemma: When New Technologies Cause Great Firms to Fail. Cambridge, Boston, Massachusetts: Harvard Business School Press, 1997. Christensen, Clayton M., and Michael E. Raynor. The Innovator's Solution: Creating and Sustaining Successful Growth. Boston: Harvard Business School Press, 2003. Christensen, Clayton M., Scott D. Anthony, and Erik A Roth. Seeing What's Next: Using the Theories of Innovation to Predict Industry Change. Boston, MA: Harvard Business School Press, 2005. Collis, David J., and Cynthia A. Montgomery. Corporate Strategy. New York: McGraw-Hill/Irwin, 2005. Finkelstein, Sydney. Why Smart Executives Fail and What You Can Learn from Their Mistakes. New York: Penguin Group USA, 2003. Grant, Robert M. Contemporary Strategy Analysis. 5th and 2nd eds. Cambridge, MA: Blackwell Publishers, Inc., 2003 and 1995. Graves, Suzanne, and John Moran. "The Pitfalls Associated with Strategic and Operational Planning." The Quality Management Forum 20, no. 4 (Winter 1994): 1–4. Henderson, Bruce. "The Origin of Strategy." Harvard Business Review, November-December 1989, 139–143. Hitt, Michael A., R. Duane Ireland, and Robert E. Hoskisson. Strategic Management: Competitiveness and Globalization. Thomson South-Western, 2005. Hofer, C.W., and D. Schendel. Strategy Formulation: Analytical Concepts. St. Paul, MN: West, 1978. Kipp, Mike. "Why Head-in-the-Sand Leadership Sinks the Ship." The Journal of Business Strategy 25, no. 5 (2004): 63–64. Miller, Danny. The Icarus Paradox: How Exceptional Companies Bring About Their Own Downfall. New York: HarperCollins, 1990. Mintzberg, Henry. "The Fall and Rise of Strategic Planning." Harvard Business Review, January-February 1994, 107–114. Neff, Thomas J., and James M. Citrin. Lessons from the Top: The Search for America's Best Leaders. New York: Doubleday, A Division of Random House, Inc., 2001. Porter, Michael. Competitive Advantage. New York: The Free Press, 1985. ——. Competitive Strategy: Techniques for Analyzing Industries and Competitors. New York: The Free Press, A Division of McMillen, Inc., 1980 and 1998. Pryor, Mildred Golden, J. Chris White, and Leslie A. Toombs. Strategic Quality Management: A Strategic, Systems Approach to Continuous Improvement. Thomson Learning, 1998. "The Story of Kiely & Carly," McClean's 118, no. 9 (2005): 29. "Three Simple Rules Carly Ignored." Business Week, 28 February 2005, 46. U.S. Securities and Exchange Commission. Litigation Release No. 18174. and Accounting and Auditing Enforcement Release No. 1796 5 June 2003. Available from < http://www.sec.gov/litigation/litreleases/lr18174.htm >. Strategic Planning article based upon key opportunities to avoid disaster. i came across the above little details about strategic management and felt comfort to some extent but i did not found any information about PIMS and SWOT analysis which may kindly be provided to me to remove my confusion.I am also a student of MBA (HRM)and i have not yet found the lecture notes about performance appraisal the one of the subjects of MBA which my very kindly be provided to me. At the end i hope you consider my request. The level of CEO salaries, and the rate with which lobbyists are sent to K Street in Washington to corrupt government exhibits the futility of focusing upon corporate success as a method, certainly, to domestic prosperity, if not global prosperity. America is certainly worse off today, the result of outsourced jobs. It's possible that it is the nature of the corporate function to hire managers to overcome obstacles by honorable means, not to escape them by dishonorable ones - like stacking of the Supreme Court, or Congress, or the Presidency. That collective ability and its capacity distinguishes the disparity between the individual and the corporation in relation to government, and in effect, ignoring that, leaves corporates free to cannibalize the American public, at least economically, and emotionally. This inherent danger may not have been forseen but is nonetheless visible, and necessary to control since unleashed, corporates can obviously do considerable damage to a nation, and none of it is a natural disaster like a flood, tsunami, or tornado, but it may do equivalent harm, as we have seen, and unemployment numbers reveal.